Wood and Fabric — what better combination? 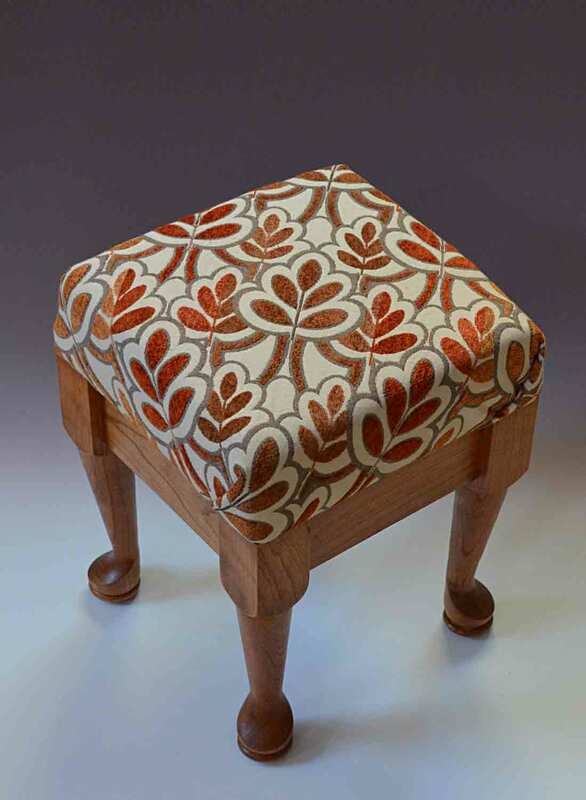 My Aunt Jo had a collection of small ladies’ footstools before 1960. This is my ‘revival’ of that memory. It’s not exactly ‘mid-century,’ but the square shape gives a nice energy to the piece. Dennis Liggett turned the cherry legs. The frame uses pockethole joinery, learned from Greg Paige at Paige Woodwoorking in Union Star, Missouri. I chose a bold upholstery fabric and a 2″ cushion for this 10 x 10″ square footstool. I am working on more styles and sizes of tops, including one to display a single quilt block. We will also sell these ready-to-cover for needleworkers. We will have several ready for the September Studio Tour and our fall selling season. Posted in blocks/little squares, Wood | Comments Off on Wood and Fabric — what better combination? In September 2015, Dennis and I had a booth at the Rocky Mtn Woodturners Symposium in Loveland, CO, right next to Northwest Figured Woods. It was impossible to resist their beautiful maple burls. The little bowl in their July 9th newsletter is made from some of the wood I bought from them. When I go to woodturner heaven, I will only turn maple burls. I hope that heaven is one of their customers, too. Posted in Wood | Comments Off on Thanks, Northwoods Figured Wood!